Cathy and Sam have more influence than they would ever have dreamed of (or asked for), but they face violent opposition with unreliable allies. Can they reshape the Split Worlds, or are their self-imposed missions doomed to fail? Cathy is Duchess of Londinium, beloved wife of William Iris-Reticulata, favourite of Lord Poppy, allied to the Sorcerer of Wessex. Unfortunately for Cathy, William is as reliable as a chocolate teapot; Lord Poppy is far less powerful than Lord Iris; and the Sorcerer of Wessex is dead. What Cathy doesn’t know may yet kill her – or see her rendered mute by a Doll charm – as both Lord Iris (the family’s Fae Patron) and the Patroon (head of the family in the Nether) are fast running out of patience with her. As far as they’re concerned, it’s time she stopped speaking out in public and started getting pregnant – and if Will isn’t prepared to take action, they’ll do so themselves. So to speak. When the Patroon’s wife, Dame Iris, dies of old age in front of her after failing to force Cathy to take a pregnancy potion, Cathy begins to realise just how much trouble she’s in. Worse, so does Will. If we have learnt anything from the first three books in this sequence, it’s that Will Reticulata-Iris can convince himself to do anything once he rationalises it as being in his family’s best interests. Having started out a member of #TeamWill with a length of rope just in case, I’ve watched him tie his own noose and climb ever higher in his search for a good enough drop. In book 4, his commitment to finding new heights may result in him passing out from oxygen starvation before he gets round to hanging himself. I’ve long-since torn up my membership badge. As Cathy works towards the emancipation of women in the Nether, Will quietly takes over first the supply of charms to the Agency and then the Agency itself (because nothing says Good Guy like running a slavery racket). It’s hard to fault his political nauss if you’re not quietly hoping he’ll redeem himself: if you ignore the promises he’s breaking to Cathy, he knows exactly how to broker alliances and cement the support of those who have influence over him. Sam, meanwhile, meets the rest of the Elemental Court, intent on convincing them to curtail their rapacious corporate behaviours. Unfortunately, he appears to be the only Elemental who actually believes in the Fae, let alone in any responsibility towards the environment or humanity. His – admittedly rather terrible – speech only serves notice that the Court have a new antagonist in their midst. Will’s opposite in so many ways, Sam even manages to get a handle on his white knight tendencies and learns to think twice before wading into an unrequested rescue. Having disliked him intensely from the start, I may – finally – be coming round. Unexpectedly, it’s Max and the Gargoyle who become a source of comfort and relief. Back in Bath, the pair have remained allied to Rupert and begun attempting to rebuild a Cloister. While Rupert is determined to drag them into the twenty-first century (Max’s confusion at mobile phones and plastics is adorable), the Gargoyle is intent on reacquainting Max with his long-forgotten origins. The juxtaposition serves up a mix of hilarious and touching scenes, which frequently delighted me. I have been frustrated by the number of plots in play – or at rest – in previous instalments; in A Little Knowledge they finally all start to come together (although how Emma Newman will untangle everything in the apparently final fifth volume remains to be seen – it’s a Herculean task). Aspects of Society that had previously been implicit are demonstrated to devastating effect (poor Cathy. Poor Margritte). Even the state of Society in America and India becomes relevant, and we finally get to meet our Sorceress and understand the true nature of the Elemental Court. Consequently, and in spite of the relentless bleakness as Cathy’s allies desert her one by one (and oh my heart, the various scenes with the new Dame Iris), I liked this far better than the preceding volumes. The stage is set for – well, what? We once again end poised on the edge: but can our impetuous, pure-hearted protagonists deliver sweeping change, or will the powers that be sweep them under the rug? Only book five will tell. When can I read book five? A Little Knowledge is available now. Posted in 2018 Nominees, Reviews and tagged 20 books of summer, 4 stars, ARC August, books, diversion books, emma newman, faerie, free review copy, sff, split worlds, Subjective Chaos, urban fantasy. Bookmark the permalink. 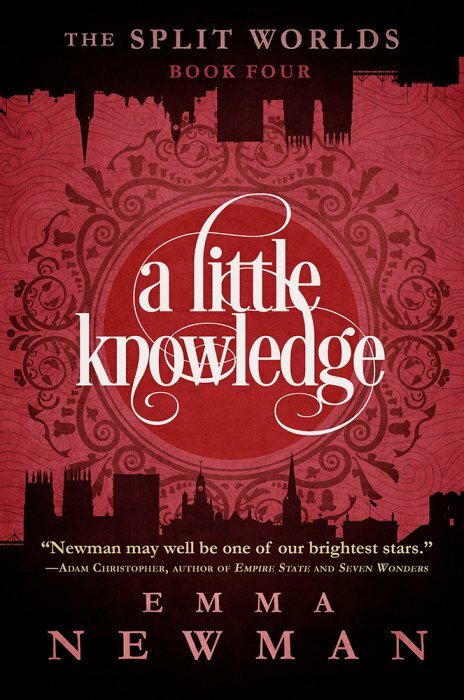 I’ve just finished this – Newman really does have a vision for where these books are going doesn’t she! I never really saw all of this coming. And Will – OMG!!! Why. Yep it’s all coming together now. Although jury is still out on a happy ending! Oh dear, is Will up to his usual Will-ness again? With your review and Lynn’s comment, that doesn’t sound good.